Whether your newly adopted fish is a gift from a friend or one which you have just bought from a pet store, there are a few things you will need to know and get ready in order to make it a fun and enjoyable experience adding them as family pets. Fish unlike cats or dogs running around the house and yard, they are aquatic organisms which you will need to house them in an aquarium. Your first step towards successfully setting up a thriving fish tank begins with the basic fish education and it’s a long journey that forms the whole learning process that you will need to put effort into it before you can become an expert. Along the way, there are many questions you should ask yourself so that you can learn, plus, there are different aspects about caring for your pet fish that you should also be aware of. However, in generally there are just a few basic things you should know before you get started. Before we move on further, first thing you should be aware of is that there are basically 3 different aquarium setup, one which is saltwater, another the freshwater aquariums and the last one is the brackish aquarium. What this means basically is that not all fish that you saw sold in pet shops are grouped under the same category. One of the most famous family pets is a clownfish, a cute and adorable small little fellow that eventually becomes a popular icon after it appeared in the movie “Finding Nemo” and that type of fish survives only in saltwater tanks. There are some popular ones which you will often hear like betta, goldfish, platy, catfish and these are freshwater species meaning that they will not mix with your clownfish. Among the freshwater types, it can be further divided into cold water species and also those that originate from tropical regions known as tropical fish. All these can be represented by the table shown below. Managing a saltwater tank is a more complicated process and thus, if you are a beginner to aquarium fish keeping, then I would suggest you stick to freshwater tanks. Ensuring top notch water quality is very important as it will determine the outcome and health of your pets and your main priority is always to strive towards maintaining crystal clear water. 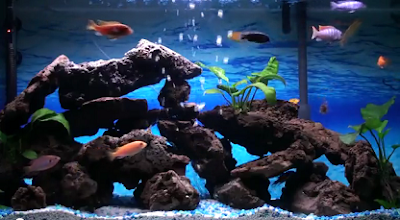 Cloudy aquarium is often a problem that happened usually during the initial stage of the aquarium setup which is caused by a condition whereby the water has not yet fully cycled. To put it in lay man’s term what it means is that the natural equilibrium process between the breakdown of waste and new generation coming from the fish has not yet reached a balanced state and thus whatever poop that your pet fish produce will keep on building up in the water. I won’t go into details about this but in order to understand more about this subject, I would suggest you read up on how to maintain nitrite & nitrate levels. One of the commonly heard questions is that which aquarium is the best to get yourself starting on the hobby? There is generally no right answer to this because depending on which type of fish that you intend to keep and your home space availability, with other constraints like money, these will determine what kind of tank you should be getting. But always, a simple rule of thumb is that the aquarium that you’ve selected must be durable and should be the largest fish tank which you can afford and with the right shape. There are people who insist on keeping fish in fancy attractions like unique bowls or tower aquariums for show display but for me, I prefer to keep it simple with a square shaped tank. This is important because it will help towards your routine chores like aquarium cleaning and the main thing is also whether your fish will feel happy living in the new home that you provide for them. Aquariums which are too small or too deep may not be suitable after all, so consult experts on what’s best for your precious pets. You might also want to check out how to select the perfect location to place your fish tank. An empty aquarium with only just the fish swimming in it creates that kind of boring impression and thus it would be a good idea to decorate things up and make the environment look natural. Plants, rocks and bogwood are the best addition to create a natural living underwater world but avoid using plastic toys, seashells and clams because these items are notorious for leaching unwanted chemicals and cause contamination to the water harmful for your pets. Choice of tank lighting is also another factor that determines how lively your aquarium can be as the right selection will provide sufficient illumination and bring out the best color of your fish. You might want to read up on subject related to aquarium lighting. Finally, comes to the most interesting aspect, which is how to ensure that everything runs smoothly. Fish like all other living organisms need to eat. As you drop foods into the water, this will be eaten up by your aquarium pets, ingested and then discharged as poop. The waste produced by your fish can be in liquid form that is soluble in water but there is also solid form that will eventually disintegrate as well. Although your aquarium filter can play an efficient task to remove the waste from the water, there is always a maximum limit whereby at one point, only a certain fixed amount can be taken out within a specific time frame. Therefore as the water continues to accumulate the unwanted materials, the quality will deteriorate and therefore, it needs to be routinely changed and added with fresh water. Apart from that, growth of unsightly green algae and sticky waste that builds up onto the surface of the tank will also become another problem that you will need to tackle. If these are not attended to, eventually it will form a layer of coating appearing on the glass surfaces and not only will it create an ugly appearance but your pets will not like it either. That is why aquarium maintenance on cleaning and changing new water are very important tasks that you should never miss out and neglect. As a beginner, it will also help if you select those type of fish generally considered as "low maintenance species". Remember as I’ve said, keeping fish as family pets is all about responsibility, commitment, time management, with a little touch of love and care.